When it comes to year-round housing on Martha’s Vineyard, finding a rental is often a very mixed blessing. Congratulations, you’ve snared a 12-month lease—at less than two-thirds your income! And deepest sympathies: When winter winds begin to blow, the utility bills are going to eat you alive. This combination punch of steep rents and high power bills is enough to send many an Island family reeling. 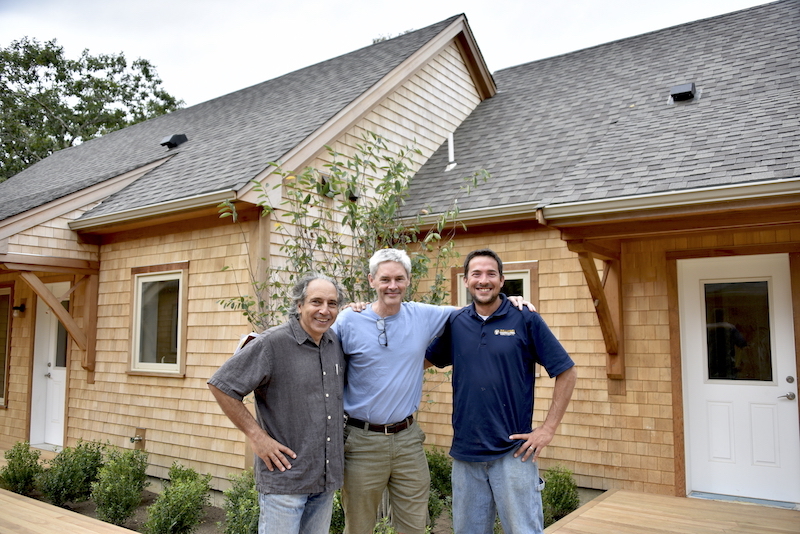 But at the new Scott’s Grove apartments in West Tisbury, affordable leases come with energy-efficient homes built to weather the Vineyard’s climate all year round. “We want the ‘affordable’ to be long-term,” said Derrill Bazzy of Island Housing Trust, which is developing the apartment complex on land owned by West Tisbury. Derrill is the project manager for Scott’s Grove, where tenants will be moving in by the end of October. “Formal occupancy is Nov. 1,” he said. “We have to be sure we’re giving them a really safe move-in date. But it’s possible, if all the pieces come together, that people could move in earlier.” For instance, Derrill said, the town needs to complete a required cistern at the nearby fire station before the tenants—chosen by lottery earlier this year—can begin living in their new homes. To qualify for the lottery, prospective tenants could earn no more than 30, 50, 60 or 80 percent of the area median income. 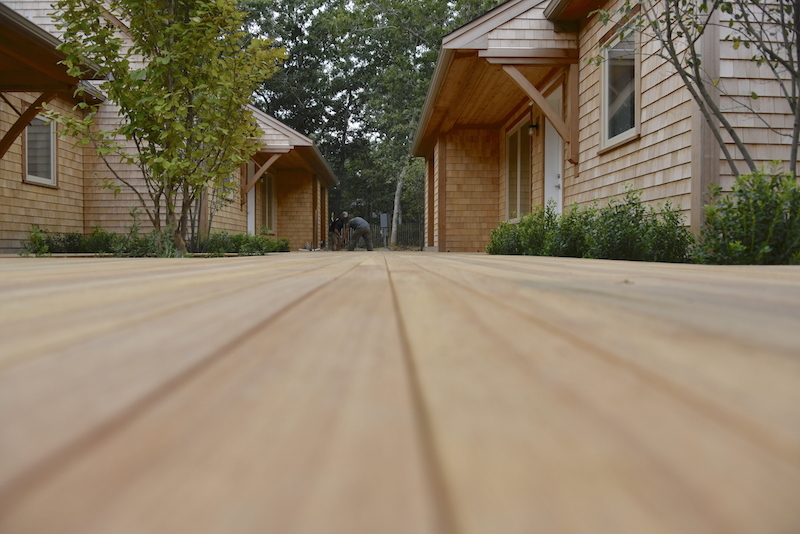 Eighty-five households applied for the nine Cape-style apartments, built in clusters connected by shared decking and set well back from the Edgartown-West Tisbury road. Next door is Gretchen Manter Memorial Field, the town’s baseball park where Little League games are played in season. 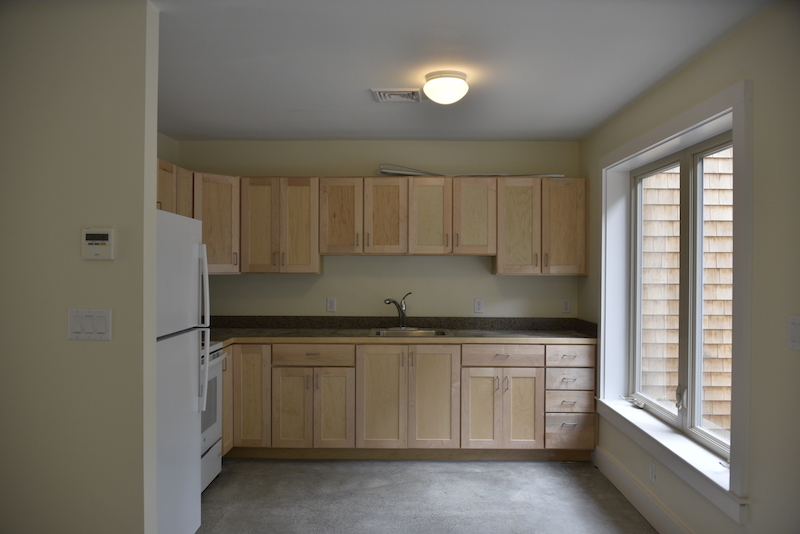 There are three one-bedroom apartments, three with two bedrooms and three with three bedrooms at Scott’s Grove, which is named for a town resident who donated the land in the mid-20th century. The one- and two-bedroom homes are on one floor; the three-bedroom design has stairs to a second-floor bedroom and bathroom with shower. Parking is outdoors and there are no basements, while the attics—insulated with cellulose from recycled newspapers—are reserved for the high-efficiency, “super cheap hot water” heaters and other building mechanicals, Derrill said. To make up for the lack of storage space, every apartment has an attached exterior storage unit for bicycles, barbecues and the like. 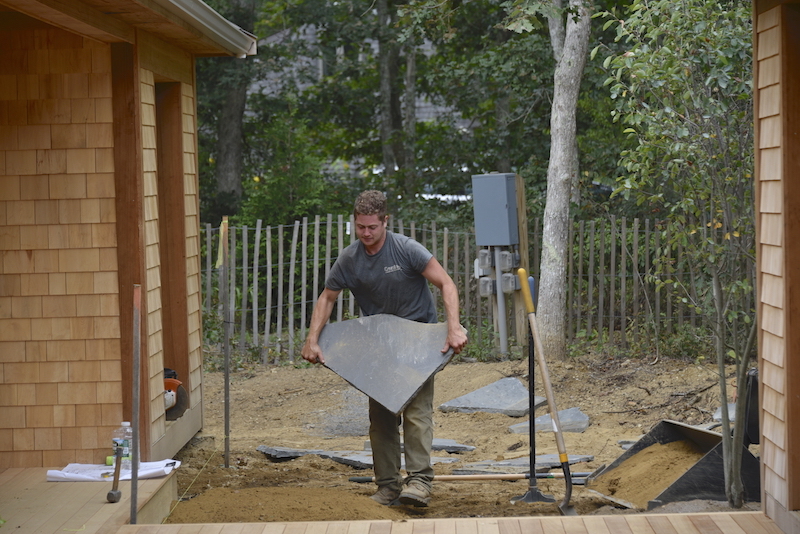 Derrill walked the Vine through the Scott’s Grove project in early September. “Like any job on the Vineyard, the last three weeks are a flurry,” he said, as workers and equipment buzzed around the site. Heaps of mulch towered in the unfinished driveways and a phalanx of nursery shrubs stood in silent ranks, waiting to be planted. “The landscaping is going to really make this place sing,” said Derrill, who worked as an architectural designer at South Mountain Company for 25 years before joining the housing trust. He spoke with pride about the quality of the new apartments. “There’s usually that thing about, ‘well, this is affordable housing,’ you build it more cheaply, you don’t have to care as much about the people living in it,” he said. Healthy building principles at work in the Scott’s Grove apartments include polished-concrete floors that are non-porous and easy to clean, paints with low or no volatile organic compounds (VOCs, a source of indoor air pollution) and formaldehyde-free cabinetry. The only carpeting in Scott’s Grove is installed on the second floor of the three-bedroom apartments, to reduce noise. “We were very careful about choosing (a carpet) that was not going to create mildew issues,” Derrill said. Keeping the air clean indoors is especially important because these apartments are so tightly built, with thick walls, triple-glazed casement windows and the concrete floors, which retain heat in winter and stay cool in warmer weather. The floors are underlaid with four inches of insulation and the building’s exterior, beneath the shingles, is completely sealed. But in such an airtight environment, indoor pollution can build up from a variety of sources. Just about anything that creates moisture, from simple breathing to taking a shower or drying laundry, adds to the risk of mildew and mold. “In most of our houses, we depend on air leakage, from a drafty door or a window, to give us fresh air. 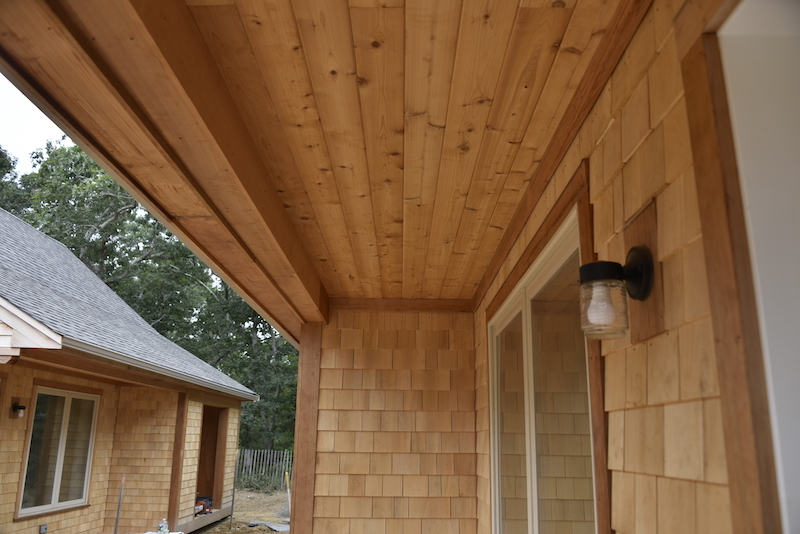 But in the winter, if your house is built to code, you don’t have a draft,” Derrill explained. Scott’s Grove is solving that problem with energy-efficient heat exchanging ventilators that bring clean air into the home while venting stale air to the outside. 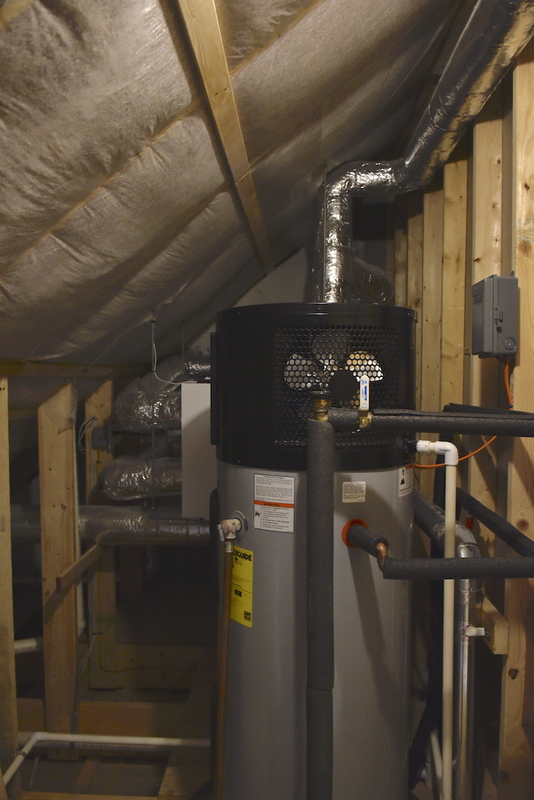 “There are 24/7 air changes going on, through filters that purify the air,” Derrill said. Derrill compares the process to geothermal heating and cooling, which use the temperature of earth to condition air. 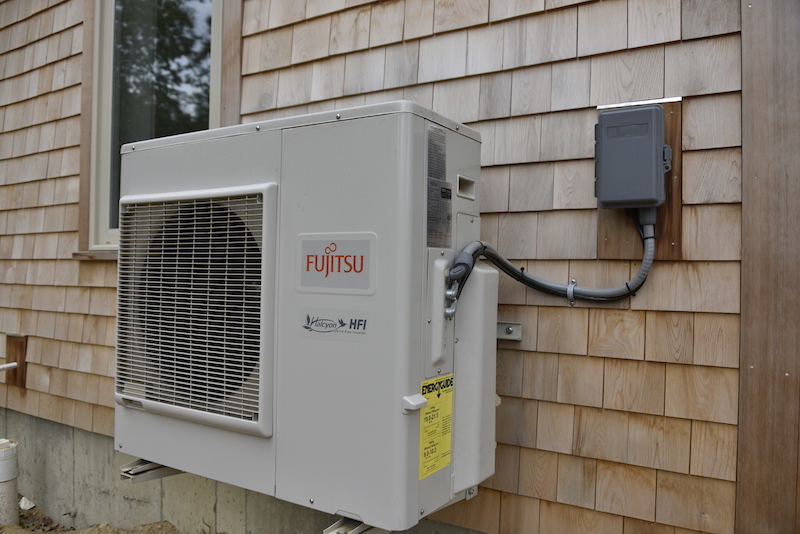 Along with keeping the atmosphere clean inside, the ventilators are “the most efficient form of heat per BTU,” (British thermal unit, a standard measurement for heat), Derrill said. Scott’s Grove tenants will see the difference in their Eversource bills. Designing for long-term affordability does bring some initial costs, but they’re worth the investment, Derrill said. The apartments are all accessible to people with physical disabilities, except for the second floor in the three-bedroom apartments. Each of the nine units has at least one bedroom and a full bath on the first floor, and complies with the elements of what’s called Universal Design. The doors have no thresholds and are two feet 10 inches wide to accommodate wheelchairs. Wooden ramps and accessible parking are also part of the design. Once the apartments are occupied, the property will be managed by the Dukes County Regional Housing Authority, which oversees more than 90 housing units on the Island. Derrill said the Scott’s Grove design will return in future Island Housing Trust developments. “We’re going to build this building again,” he said.